"Swiss time is running out", a line in Deep Purple's smash hit "Smoke on the water" goes. How true. In what seemed like a heartbeat, an intense but throughly enjoyable week in the alpine country has gone by, and I am once again typing this high above the Atlantic (it's LX86 in this direction, if you care to know). Unfortuntely, even the masters of watchmaking can't stop the time from passing, no matter how much one would sometimes like to do that. But by the same token, it won't be too long until my next visit is due. Then, I will be bearing Chirstmas gifts. If nothing else, a lack of time serves as a great motivator to make the most of the few moments at hand. Which was part of the reason for me to invite my dear friends to a relaxed mini party at a Winterthur lounge bar the night of my birthday. What better way to celebrate than amidst people I hadn't seen in such a long time? That the venue of choice, an old favorite from my student days, is called "Plan B" only seemed appropriate under the circumstances: Not that my guests were B-list, of course. But for all I remain committed to my Plan A in Canada, it seems both fulfilling and reassuring to nurture friendships that are no longer around the corner. As I've come to realize, time is a key ingredient in growing these social roots. Looking at the merry gathering of friends that night, it occurred to me that they represent the best and dearest of each of the past few "chapters" in my life. Some I've first met as much as 20 years ago, others only just before I left Europe. It's hard to say what exactly made each of them stick to me, but I am very grateful that they did. And I wish I would have had the time to catch up with each of them for hours on end. Another thought also crossed my mind - and it was no less reassuring than the turnout that night: If it took 15 years to build such a strong and amicable network of friends, isn't it only logical that, after just a bit more than a year in the new world, I should not yet expect the same? Instead, I shall carefully hedge and nourish the sprouts and seedlings that there are - and a full bloom should ensue in time. 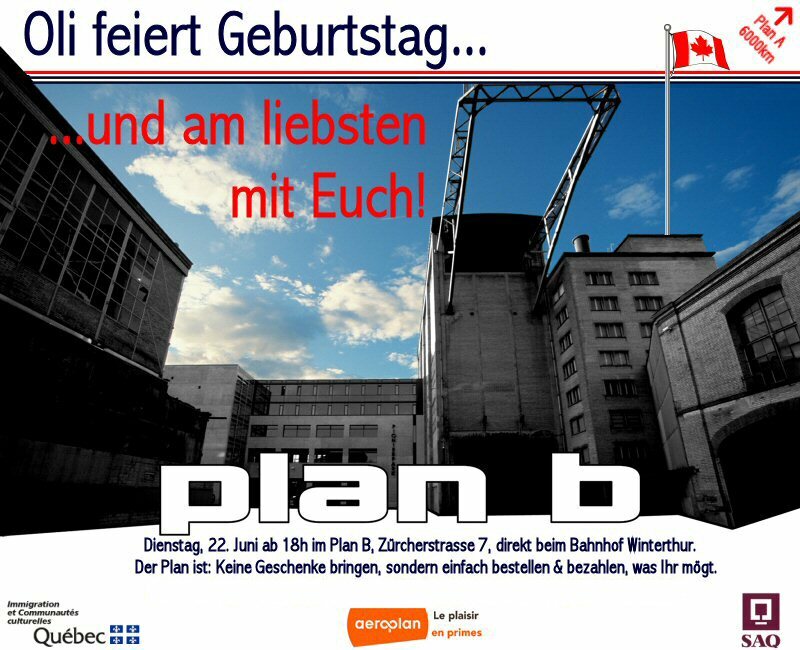 Until then, I am happy for Plan A and Plan B to overlap a bit: After taking Montreal friends to Switzerland last winter, Swiss visitors continue to book trips to Canada at an almost monthly interval. Together, they will ensure that this latest chapter in my great adventure is sufficiently intertwined with the preceding ones. And while the ending is still unplanned, I am keen to write the next page.